There is not a lot that can be said about this Madame Tussauds bespoke job. I rarely get uber excited any more when I receive the work, partly because after 7 years the buzz has worn off and sometimes because I have no idea who the person is that I am making for. I don’t really think either of those apply here. I’ve been bursting to tell you and thought that this wasn’t going to come out until closer to the Royal Wedding later this year. 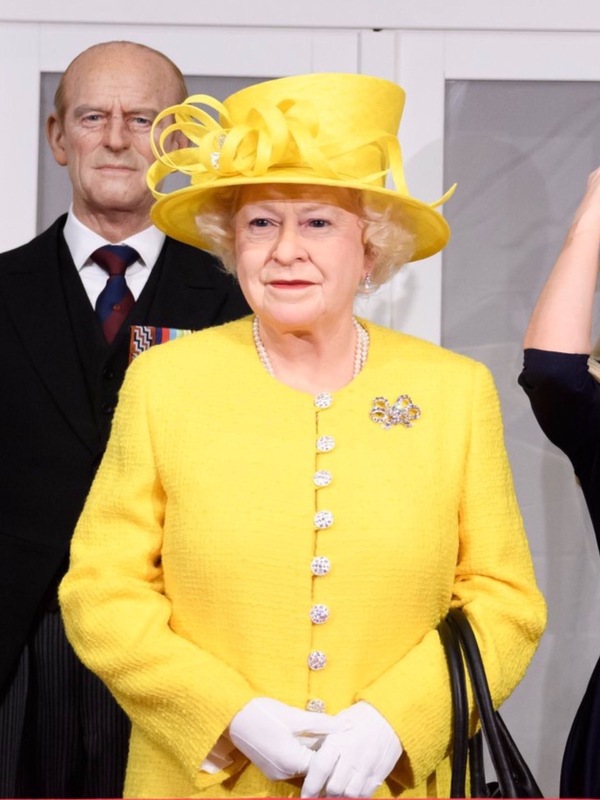 Her Majesty is pretty well known the world over and, as she is an upcoming Grandmother of the Groom, I expect that the images of her wax figure will be seen all over the world. 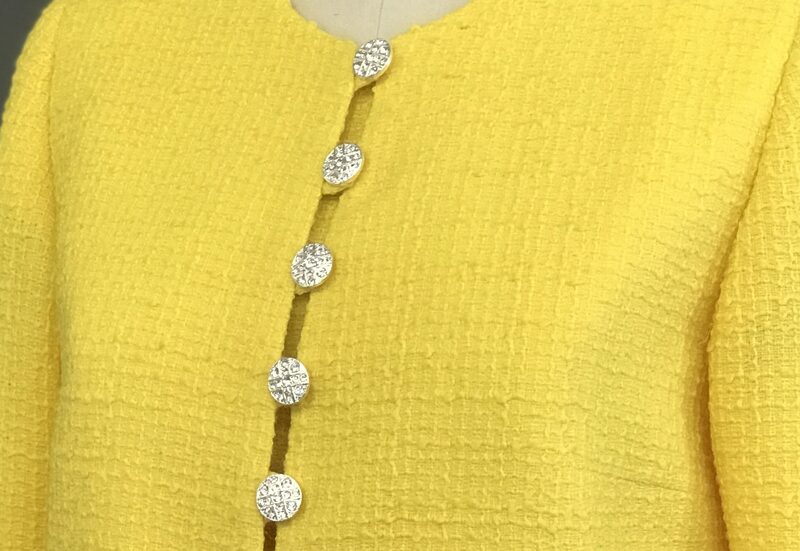 it is indeed a yellow dress suit fit for a Queen. 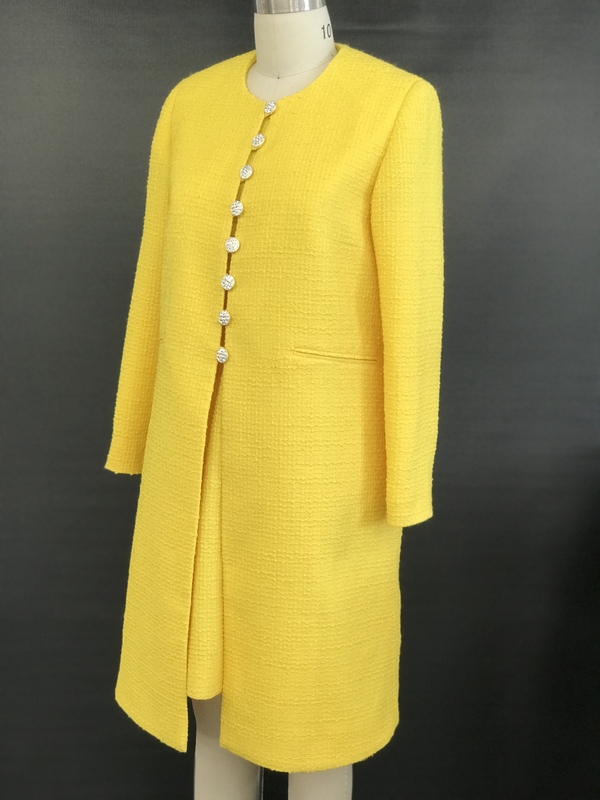 The fabric is a sunflower yellow boucle tweed and was used for both the dress and coat. It is finished simply with diamante buttons and loops. The simplicity of the style keeps the outfit elegant, classic and understated, if you discount the bright colour. Head to the Bridal suit and Special Occasion wear page for more ideas on what we can do for you. Whether it’s a business dress suit, formal occasion or wedding suit, we’ve got all the ladies bespoke options covered.